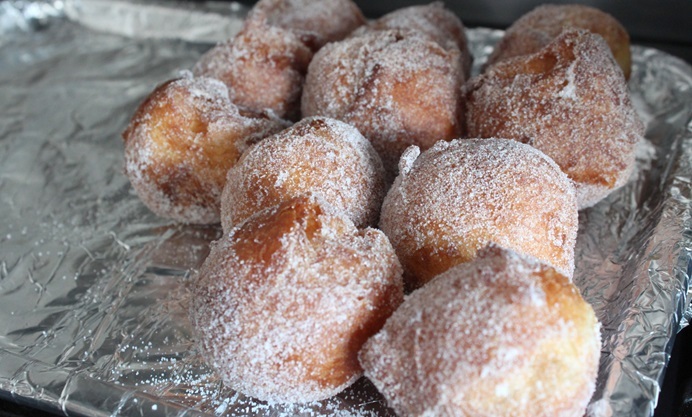 These traditional Catalan doughnut-like sweet snacks make their yearly appearance around All Saints' Day. They are easy to make, if a little labour intensive, and very, very moreish. Bunyols de vent (not to be confused with Bunyols de Quaresma) are enjoyed across Catalonia on All Saints’ Day (Tots Sants). The day is a bank holiday and is dedicated to the memory of the deceased, particularly one’s ancestors. Even though All Saints’ Day is one of the oldest festivals in the Christian world, it’s not that well known outside Christian communities. That might be because it’s sandwiched between two better-known, more marketable holy days: Halloween and All Souls' Day on the 2nd of November. It is custom for the living to visit the dead on the 1st of November with many families parading up and down cemeteries across the country, cleaning graves and arranging flowers. Then the dead supposedly visit the living on the following day. It’s all very intimate and celebrations are held privately with family. The origin of bunyols, however, is not strictly Christian. Sephardi Jews were making these lovely fried morsels to celebrate Janucá (Hanukkah) as far back as the 10th century – they called them bimuelos. Christians did what Christians do best and adopted them to celebrate All Saints' Day, due to both being celebrated at a similar time of year. 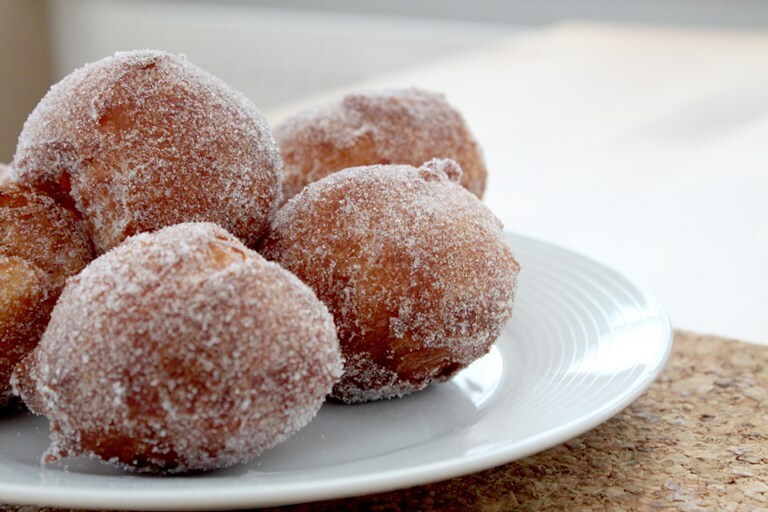 From the end of October, bunyols can be seen in most bakeries and children will even make them in school to bring home. Mums and grandmothers make batch after batch of the sugary treats (this is my mother-in-law's recipe) and they will tell you the trick is to keep the oil temperature just right – too low and the dough will sink to the bottom of the pan, too high and the bunyols will develop a crust which will make it impossible for them to expand. 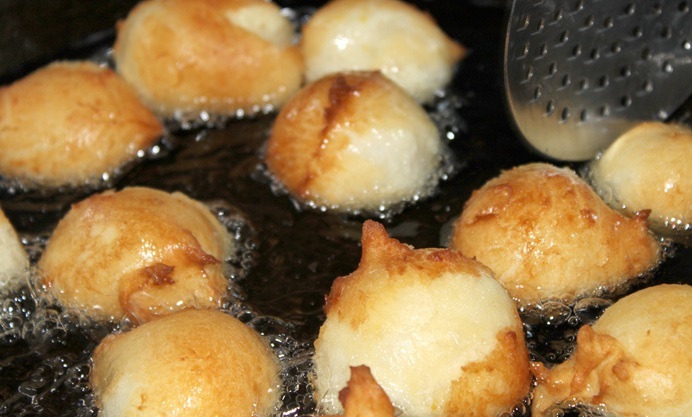 The 'de vent' or 'made of wind' epithet is because bunyols can (and do) expand to twice their size when fried. They are airy and wonderful so it’s quite easy to get carried away and eat a dozen of them before you feel like you may have over-indulged. They are definitely better enjoyed with a tall glass of ratafia, a herb-based liqueur from Catalonia. Leave to cool for at least an hour before eating them. If you try them while warm they will seem undercooked! As Head of Content at Great British Chefs, Gemma was responsible for the initial research that led to its creation.